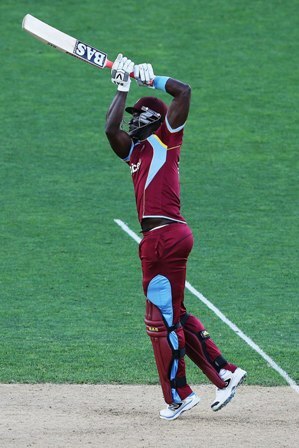 Darren Sammy in full flow as he hits straight over the top. [www.inewsguyana.com] – The West Indies will head into the final one day international this evening and the T20 series without their Captain Daren Sammy following a hamstring injury. Sammy suffered his injury when he was running around a damp outfield in Queenstown before the third One Day International (ODI). His place has been taken by left-arm spinner Nikita Miller. Dwayne Bravo, the one-day captain, need to take the reins as the T20 leader for the series which begins on Saturday and ends on Tuesday in Auckland and Wellington respectively. This adds to the already long list of injuries plaguing the West Indies team. Apart from Chris Gayle, who is recovering from a hamstring injury and injured Sammy, Marlon Samuels with a wrist injury and Darren Bravo have flown home while Ravi Rampaul suffered a broken finger although he remains on the tour. Kemar Roach and Kieran Pollard are also missing – Pollard is still recovering from a knee injury. However, Andre Fletcher, Andre Russell and Samuel Badree have joined the squad in New Zealand.